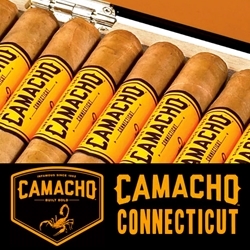 Introducing the Camacho Connecticut premium cigar. This hand-rolled gem offers a smooth medium-bodied smoke that brings a full-flavor experience that is truly enjoyable. Filled with a special blend of Honduran and Dominican long fillers inside Honduran binders, and bundled up perfectly inside a silky Ecuadorian Connecticut wrappers. The makers of Camacho Cigars have created a flavorful recipe inside each of their tobacco blends making them very smooth with a hint of cedar and earth. The light brown Ecuadorian Connecticut wrapper adds in a little zest with tastes of pepper on the back-end. Smoking a premium cigar that successfully finds the balance between boldness and distinct flavor is hard to come by. You can find all of those combined traits when you pick up a box of the Camacho Connecticut cigars. Check out all the styles available here today for a discount price! Call us for more details!